Hoard chronology is a floor-based object installation. It consists of an arrangement of objects; media (records, cds, tapes, film) and technology (turntables, mixers, video game consoles, vcrs, monitors). All arranged in chronological order of acquisition and creation. The door to the small space stays locked, as there is no floor space unfilled. Viewing can thus only occur through the segmented outside window. The work being contained within a structure than encourages a flattening of the viewing space. Creating a wavering between consumption as an image and/or as a selection of objects within space. 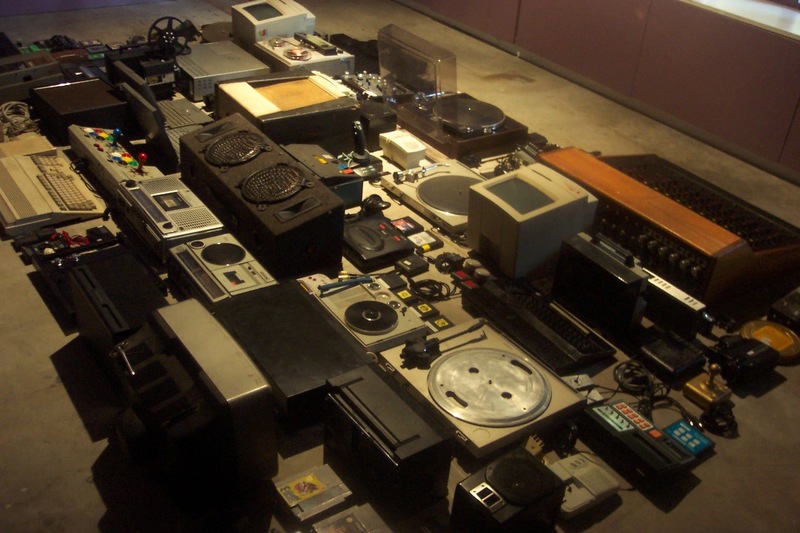 Hoard came about primarily because throughout it’s entire length; my practice has involved relationships with technology objects and media. My practice not very static or stable, It could be visualised as an experimental process based movement through time occasionally manifesting in either a lasting or ephemeral outcome across a vast array of media. There exists also generally an element of the improvisatory, and to a lesser extent of the emergent. As time adds it’s subtle shift and a relationship with a particular machine or media runs its course, a new one comes to take it’s place. It was at a point where I realised I could look back from this point in time and visualise a near perfect map of this stream or residue that Hoard: chronology became an idea. Technology, because of its rapid evolution, bears the marks of time and nostalgia quite unlike anything else. For a rapidly developing organism such as human, being confronted with the glaring simplicity of technology just ten years old can often be a slap in the face for our dignity. Coupled with a kind of jokey nostalgia, a kind of “look how big it is” amazement. Hoard attempts to lay out the objects in a flat terrain, to give them all right angled relationships with one another, and see what kind of connotive points join up. Never far from consumerism the objects sit behind glass, where they were designed to sit at their birth. Like a shop front window they sit, no longer virgin and pristine, but scratched, scuffed and charged with use. In warm conditions, the Black-Bellied Dew Lover (Drosophilia Melanogaster), a species of fruit fly, has an eight day life cycle. In this time, a larva hatches from an egg and metamorphoses into an adult fly that, twelve hours after freeing itself from its puparium, will mate and lay eggs, thereby initiating another cycle. To us, this diminutive life span may seem appropriate for an insect that we usually hold responsible for turning already repulsive overripe fruit or garbage into stomach-turning infestations but this characteristic has also elevated the fly to be the one of the most studied organisms in biological research. The brevity of the flies’ life cycle results in a rapid rate of genetic mutation, allowing Darwinian evolution to be observed in accelerated time; it follows that the species is highly adaptable to the changing surrounds and that the congenital characteristics of individual flies reflect strongly on recent (on a human time-scale) environmental conditions. This notion can be generalised to state that the traits of fast-changing, adaptive phenomena are highly indicative of conditions and changes in the environment from which they are engendered. Given this, what does technology, clearly one of the most rapidly evolving phenomena today, reveal about us and the social conditions that have exerted creative influence? The study of technology as a social manifestation is not new: the wheel, flint tools, various metallurgical advances, and even the Gutenberg press have been described as milestones in human development. However, it has not been until recently that we have observed an explosive growth in technological progress; our computing elements double in speed and halve in size every eighteen months. The potency of this idea, that we can use technology as a lens through which we can question and interpret social behaviour, is demonstrated by the seemingly endless questions that effortlessly arise once we engage this mode of thought. Although we may be initially distracted by unusual, trivial issues (for example, what do we really find attractive about robotic dogs?) the wider issues are readily present: why is science fiction a good predictor of technological invention? Does this indicate the influence of a particular population sector or a type of individual, or does this reveal something about the mechanism of collective desire? It is evident that much consumer technology such as portable audio, home theatre and video gaming encourages insularity; is this disconnection a cause or effect? Does the availability and compulsiveness of the technology create seclusion or is there a predilection for self-absorption in individuals or family units? As this technology is more accessible to the affluent, is there a relationship between wealth and isolation? With the growing availability of choice in consumer technology, there will be increasing distinction between individuals in the particular types of technology they engage with as well as the nature of their engagement. As this technology is pervasive, it can be argued that it is now possible to meaningfully chart our individual lives through the technological choices we make or the ones made for us. For example, one child’s access to specific content on the Internet may have wide-ranging implications on their learning process, which may then influence the available opportunities and critical outcomes in their adult life. Is it then possible to shift the scale of this line of investigation from the individual to family units, communities and nations? The endpoint of these questions is an existential one: what will be discovered in the archaeology of this time? What objects will be our museological representatives in five millennia? It seems certain that these objects would be our technology: as the Sumerians are now the race that invented the plough, it will be the residue of our cars, our mobile phones, our electric lighting and our houses that survive us. What will these then reveal about us?